Updated By Win Rate 23/08/2013 - Please be patient while they load! Wobblybob, Cheesyboofs, Tanknutdave, Tacticalpr0lap5e, YourMumsNewBoyfriend, SpikyDude, VanLindenau, Streetstench, Raptor_q. A Brief History of TNAC. I was plucked from obscurity by Wobblybob to join a predominantly German Clan following some in-game banter. In that German clan I became friendly with the other clan members that shared my sense of humour, Tacticalpr0lap5e, his brother YourMumsNewBoyfriend, SpikyDude, VanLindenau, Streetstench and Raptor_q. We all became quickly disillusioned with the Clan leaders dictatorial approach to leading a clan, leaving Wobbly to clean up the mess on more than one occasion. We all knew it was Wobbly’s clan really in all but name. I then set up a Teamspeak server so that we could chat in secret and plot our extraction from this doomed clan. We needed one more person .. Wobbly, but because he was adamant he was going to stick at it till the bitter end he took some convincing. We got him onto the secret Teamspeak server and convinced him that if he was to set up his own Clan he would have a loyal core following that would make up the basis for a very strong clan. The clan was born in all but name! Wobbly was adamant that if we set up a new clan it was to have more substance than most other clans, he wanted it to have a presence outside of the game. At this point Wobbly recruited TankNutDave of the website with the same name and strong links back to the games creators, and 1at7 was seconded as Clan artist. 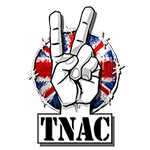 The clan now had a name [TNAC] Tank Nuts Armoured Corps and a sweet logo. Our aim is to create a community of players that both enjoy the game and are interested in all things related to armoured warfare. All nationalities are welcome so long as you can understand and speak English to a basic level. A Clan focused on Clan Wars. A Reasonable level of skill, tactical awareness. The clan language is English. Communication is by Teamspeak 3. We encourage our players to be active in verbal communications. If you are shy you must still participate in TeamSpeak to hear instructions from the field commander even if you have no mic. As you gain confidence you are encouraged to use a mic to join in the friendly banter. In Game: Platoons, Company and Clan War teams. Clan Chat box - Jokes, battle results, banter are fine. Racist comments, personal attacks or raging will not be tolerated! Follow existing game rules. This is enforced directly by Wargaming.net. Persistent infringements or complaints to Clan Commander will result in kick. Banter is expected, any form of bullying is not and player will be kicked. Radio silence! Follow directions of Field commander. Only report important info. Please don’t jump into populated platoons unless requested to do so or you are sure it’s all good. Poke or PM in-game 1st, Or sit in “Available to platoon”, makes for a happy Clan. A good write-up: The befits of using XVM and how to use it to improve your game. These videos are shot zoomed out at 1080p. Best watched full screen @ 720p or 1080p (bandwidth permitting) by clicking on the YouTube icon lower right of the video. They can be quite dull to watch but are intended for the retrospective analyzing of clan progress and documentation.